DIMENSIONS-Gold Collection: Counted Cross Stitch Kit. Gorgeous images, phenomenal detail and the highest quality of materials available go into every Gold Collection kit by Dimensions. Each of these Counted cross stitch kits feature easy to follow charts that include the use of half stitches to elicit finer details and more realistic shadows. This kit contains 18 count ivory Aida, 100% cotton thread, thread palette, needle and easy to follow instructions including a multi-colored chart. Frame/Mat are not included. Finished size: 9x16in. Design: Cozy Cove. 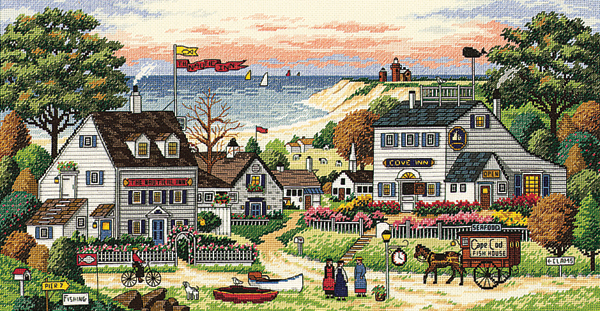 Designer: Charles Wysocki. Imported.